… It’s just one word but it says so much. At Paul Weise Furniture, a full service design firm that provides customers with every decorating need from start to finish, their emphasis on quality services has made them one of Milwaukee’s leading furniture and design companies. 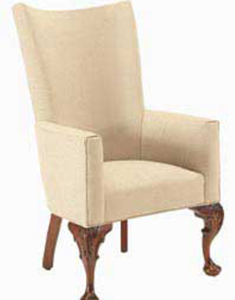 Paul Weise also offers a customer a re-upholstery option, done in their own shop right on the premise, where they provide full restoration of pieces such as family heirlooms, antiques or just favorite pieces. They feature thousands of fabrics from the finest mills for customers to choose from, representing one of the finest selections in the Midwest. Customers can also select from this collection when buying new furniture. The fabric is then sent to the furniture manufacturer to use to customize the piece (this is referred to as COM, or “Customer’s Own Material” and offers Weise clients a much larger fabric selection than provided solely by the furniture manufacturer). Stein added that extra material is often used to make pillows or used as a decorating accent elsewhere. Their reupholstery department also can redesigns pieces, (change arm or back styles) and make upholstered headboards to update an existing bedroom pieces. Restoration services include refinishing the wood or simply touching up the finish, regluing and reinforcing the frame, and retying the springs or making new seat cushions. In many cases they may reshape and redesign a customer’s present piece of furniture into a new shape. They can also freshen up a family heirloom and clean old fabrics or needlepoint. “We have the master craftsman, the upholsterer and the interior designer all working together for the benefit of the customer,” Stein explained. 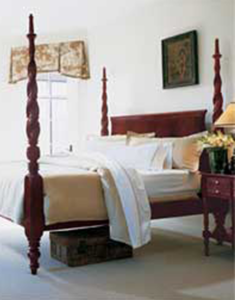 Paul Weise craftspeople are also known for custom fitting furniture. For instance, if someone doesn’t like the way a piece of furniture sits or feels — perhaps the pitch isn’t quite right for that particular customer — they will fit the furniture to their body. This service is especially helpful for people with bad backs. When it comes to accessorizing a room, Stein feels his employees are some of the most knowledgeable in the marketplace. All their interior designers hold a degree in interior design and have an art background. And Stein emphasized that the furniture and accessories they carry are the finest they can find. Paul Weise specializes in traditional and 18th Century furniture with some Contemporary and Casual styles. “Traditional furniture is timeless and the exceptional quality we carry lasts. Plus it is easy to fit in; you can always work around it or simply change a piece here and there,” Stein said. “The contemporary and modern pieces can be fun, but they eventually become tired and dated. You can definitely see the dates of the ‘6Os, ‘70s and ‘8Os, whereas with good traditional furniture, the basics don’t change and you can blend them in with whatever you’re doing in an existing or new home.” In addition to having worked on some of the finest homes in Southeastern Wisconsin, Paul Weise’s award-winning interior designers have been involved with some of the area’s finest companies — redecorating and furnishing their executive offices. They also work with builders and remodelers so that everything flows through to the final product, instead of just adding the furniture later. “Builders or remodelers are not necessarily designers, and may not be specialists in space planning,” Stein pointed out. “Sometimes things look good on paper but don’t work well in real life use situations. Our designers are used to this and can spot the problems before the mistakes are made with traffic areas and living space. They can judge if the furniture will fit and if it will be able to be used the way the area was meant. They often stop mistakes before they become a problem,” Stein added. “We’ll make sure the walls are properly prepared if they are to be wallpapered and can also manage the colorization. We try to go the extra step for our clients and they are not charged extra for these services. “Our goal is to make every customer satisfied with the end product,” Stein explained. “Sometimes that means taking things back, even custom made items, and giving the client something else. Because much of our business is word of mouth and because many of our customers do a lot of entertaining, satisfied customers are very important to us. That’s part of the philosophy I grew up with and it’s the way I was taught to handle customers.” Stein said that his family has been in the furniture business for three generations. They’ve had other stores in the Milwaukee area and his father, Edward Stein, continues to work with them at Paul Weise Furniture and has done so since they first became involved with it in 1981. According to Stein, the Weise family started the business in 1886 on the corner of Albion and Farwell, where Paul Weise is located today. (The original building faced Albion St.) They had an upholstery and cabinet shop and made a large portion of their own furniture in addition to buying from other manufacturers. Another section of the building was completed around 1910 and other portions added through the years. A drapery shop was installed shortly after the first addition. Throughout the years, Paul Weise Furniture became known for traditional furniture, usually in mahogany and cherry, and for their outstanding service. The Weise family owned the company until 1978 when it was sold to a group of real estate investors who added contemporary furniture lines.